For your perfect family ski holiday in Austria! Our family-friendly Kinderhotel lies in the center of the Schladming-Dachstein region at the foot of the Hauser Kaibling ski mountain, the easternmost access point to the four linked ski mountains including Planai, Hochwurzen and Reiteralm. Focused on the particular needs and requirements of families, our hotel offers are designed to help you plan your family vacation. Childcare in a loving and safe environment will give parents the peace of mind and flexibility to enjoy whatever activity they like while the kids have a blast with their own program. Kids from age 3 are in the best of hands with our local ski school. "Minikids" ski school children (ages 3 -4 ) will be picked up at noon, taken to the hotel to have lunch and spend the afternoon with fun and games in the hotel's kids club. The ski school's practice area on the mountain welcomes kids from age 4 helping them to develop the confidence to explore the slopes of Schladming's four interlinked ski mountains. Located at the edge of the village Haus im Ennstal, our family-friendly ski hotel is only 800m from the Hauser Kaibling base station featuring ski school, sports shops etc. Enjoy being chauffeured to the base station (2 minutes driving time) every ten minutes in the morning and afternoon by ski shuttle buses that stop at the hotel's front door. The downhill run will take you directly into the village of Haus just a few steps from the family-friendly ski hotel after a perfect day of skiing. Ski holidays with big kids - the Schladming-Dachstein region also has a lot to offer teenagers! Not in the mood for ski school instruction? 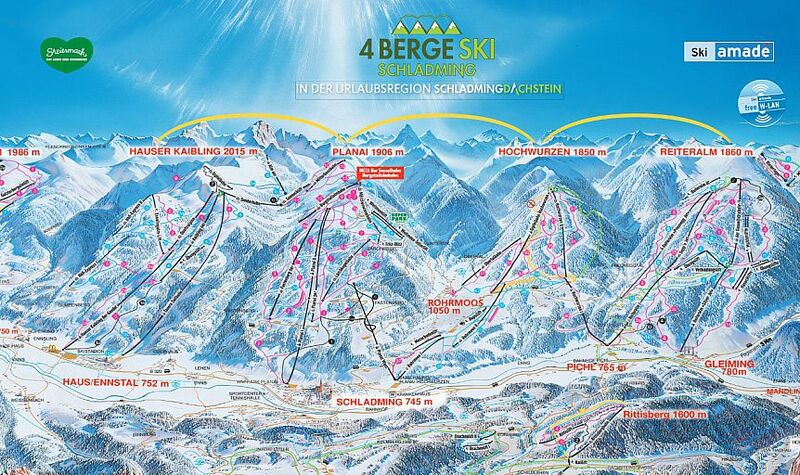 No problem, the Schladming-Dachstein region has a lot in store for older and more seasoned skiers. The local ski school offers youth camps to help advanced skiers aged 12 to 16 years take their skiing to the next level. Another option includes a trip to QParks Horsefeathers Superpark Planai with the opportunity to meet like-minded peers. Be sure to have the best time on the mountain! You don't need to ski or snowboard to have a blast in the Schladming-Dachstein family region. Enjoy the beautiful winter landscape at your own pace with guided snowshoe hikes offered two times a week, joint toboggan outings during holiday periods and horse-drawn sleigh rides outside holiday periods. Sport Hauser Kaibling stands for the latest in winter sports equipment, stylish and functional sports fashion, expert advise and service. Only the best for our guest and a 20% price discount on ski rental and service!!! Reserve your rental skis comfortably from home. Pay on site in the shop with a 20% guest discount.